Latest survey by top international consultants Ernst & Young, “EY’s attractiveness survey: India 2014 – Enabling the prospects”, based on interview with 502 representatives of international and local opinion leaders and decision-makers, has said that 51.2 per cent of the global investors say that Mumbai is the “most attractive” city of India, followed by Bengaluru (37.8 per cent), New Delhi (37.4 per cent), Chennai (14.6 per cent), Pune (13.1 per cent) and Chandigarh (10.7 per cent). 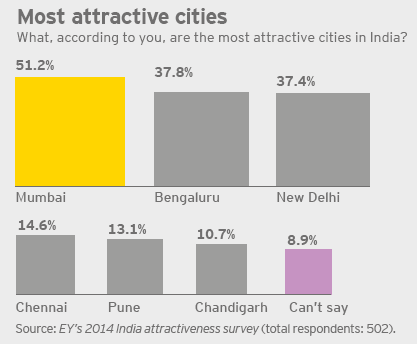 Significantly, the EY survey does not find Ahmedabad in the company of these “most attractive cities”. The survey underlines, “When asked about the most attractive investment destinations in India, Chandigarh was the only non-metropolitan city named by respondents.” As for Ahmedabad, the FY survey finds, 20.7 per cent of the investors find it the best “emerging city” which has potential for growth – but is still not “attractive” enough where investments could be made. The cities that follow Ahmedabad are Jaipur 8.9 per cent, Coimbatore 6.1 per cent, Surat 5.9 per cent, Kochi 5.8 per cent, and Aurangabad 4.4 per cent. Further, Ahmedabad does not figure in the report among the top six cities attracting foreign direct investment (FDI) between 2007 and 2012 either. The highest investment was attracted by New Delhi ($29.9 billion), followed by Chennai $25.1 billion, Bengaluru $24.5 billion, Mumbai $15.3 billion, Pune $11.1 billion and Hyderabad $ 10.8 billion. 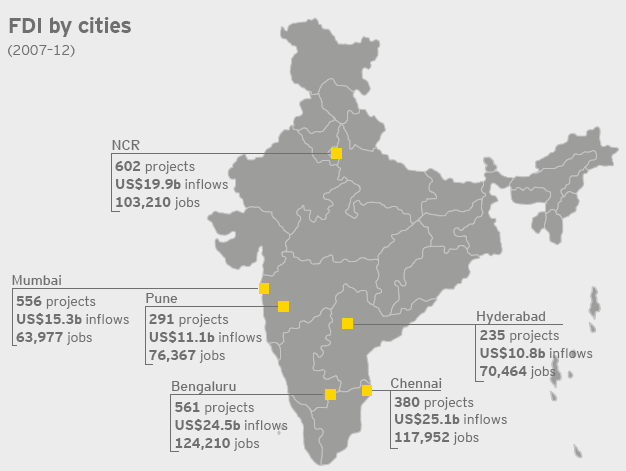 EY says, “Actual FDI performance and our survey results both show that metropolitan cities, such as Mumbai, Bengaluru, the National Capital Region (NCR), Chennai and Pune, remain key attractions.” As for the non-metropolitan cities, it adds, “there is a significant awareness gap” about rest of the cities, including Ahmedabad, which is considered as the most “preferred choice in emerging cities, followed by Jaipur, Coimbatore and Surat”. Pointing out that “India’s education sector is still developing”, and “it requires as much attention and investment from private and foreign players as it does from the government”, the survey emphasizes, “Between 2011 and 2012, the number of projects in education and training increased from 17 to 26, while capital investment decreased from US$246.8m to US$206.8m (INR13.3b to INR11.1b).8 The US is the top investor and Bengaluru, Mumbai and Pune are the top destinations for education projects”.